The Continental Army was founded on June 14, 1775. 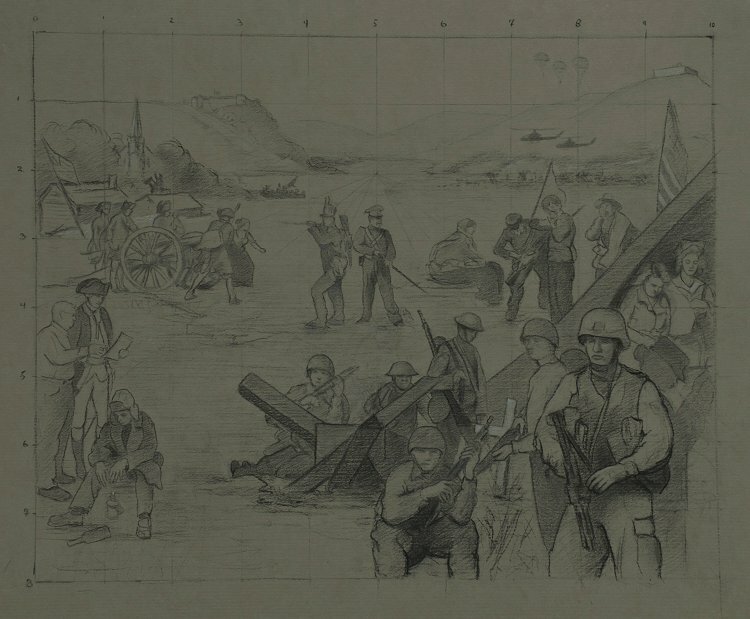 The artist’s composition serpentines through history and represents major events and periods depicting men and women in uniform. There are symbolic items or small still life vignettes displayed on the ground and nearby. In front of the church there is a four-person cannon team from the Revolutionary War. The woman with the team is Molly Pitcher, the first woman ever compensated by the U.S. Government for military service. There is representation of familiar places and faces from history: Valley Forge, Paul Revere, and George Washington crossing the Delaware. As your eye moves to the right there are soldiers from the War of 1812 and the Mexican-American War fought in the late 1840s. The Civil War is represented by three figures: Minnesota Militia (Red and Black) and Union Blue. The woman in a cloak was a spy. The shouting figure next to the American flag fought in the Spanish American War. Further down the right side is a tent showing women’s involvement in nursing during WWII and the Korean War (however, their presence in nursing predates these time periods). The WWI figure near the cross pays tribute to a fallen comrade and the beginning of the veterans’ cemeteries overseas. 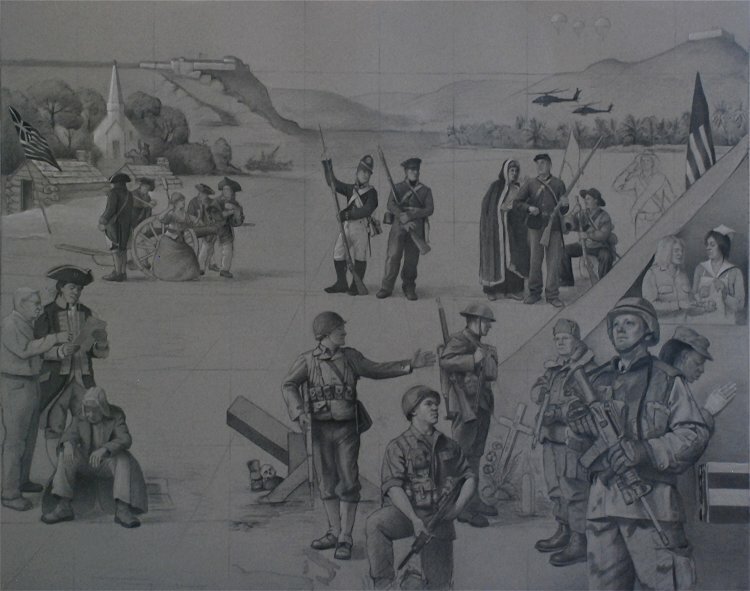 WWII is represented by the figure in the center followed by Korea, Vietnam and Desert Storm. Behind the Desert Storm figure is a female soldier paying her respects near the flag-draped coffin. She is wearing the current camouflage uniform. 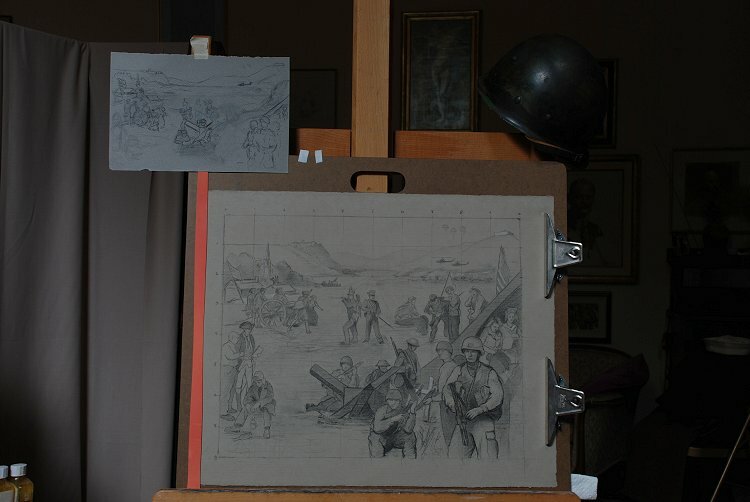 Other images at the top of the painting are Fort Snelling on the left and the Abbey of Monte Cassino. Helicopters are the modern-day Cavalry.